The UK’s Girls Education Challenge is providing opportunities for both children and teachers through new community-based education classes. Shabir lives in a remote village in Parwan. He was disabled in an accident when he was young and has to use a walker to get around. In spite of his limited mobility, he was able to graduate from high school and is enthusiastic about the benefits of education, not just for himself, but for everyone. Shabir looked for job opportunities after he graduated so that he could support his family. He applied for positions in health clinics and government schools, but was never accepted. Shabir has always seen his disability as an obstacle to getting a job, because employers might think he is unable to walk long distances or meet job requirements. I am delighted to support children’s education in my community and donating a room was what I am able to do. 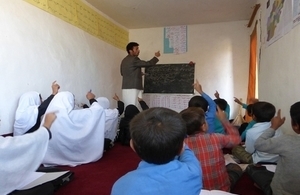 After the village established the school management committee, community members and committee members recommended that Shabir be chosen as the teacher for the class because he had finished high school. He has been working as a teacher for two years now, educating children from the local area. Shabir is serving his community as a teacher, but he’s benefitting too. The salary Shabir receives has helped him overcome financial problems and support his family. There is no doubt that Shabir is a dedicated teacher. He arrives in class on time and well prepared with audio visual materials, which he prepares himself. He often seeks advice from other teachers on how to improve his own teaching. As a result of his hard work and commitment, he has won the respect of his students, community members and other teachers. The UK is supporting community-based education through the Girl’s Education Challenge programme, across Afghanistan.